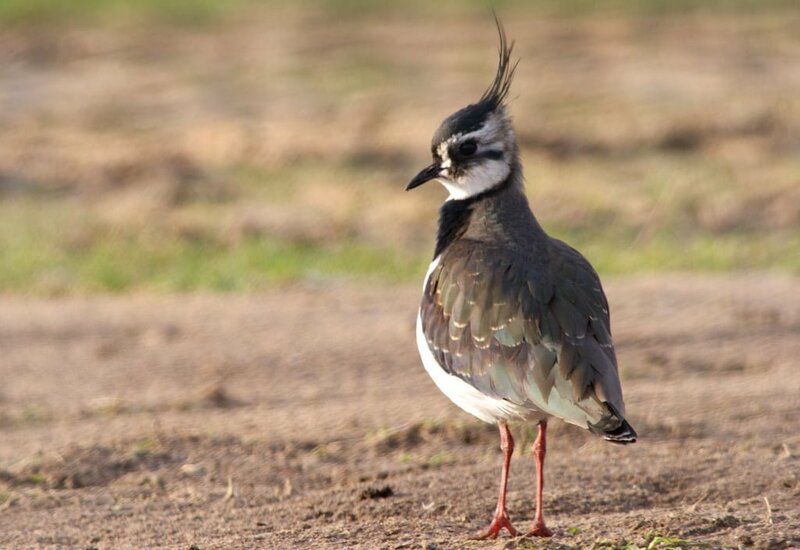 The lapwing, also called the green plover and the peewit, is a common resident and winter visitor on coastal mudflats and mixed farmland all over Ireland. Despite this attractive wader’s common and widespread status, alarmingly populations have declined by more than 50% in 25 years. The species is red-listed on the Birds of Conservation Concern in Ireland (BoCCI) list. Lapwings are handsome wading birds, with a broad black breast-band, white underside, iridescent green and purple back and a distinctive wispy crest. In flight they can be recognised by the rounded tips to their wings, their black and white under-wing and their slow, almost ponderous wing beats. Dense flocks of lapwing have a “flickering” appearance in flight, an effect caused by the alternating black and white flashes of their many flapping wings. The name “lapwing” is derived from the Old English word hleapewince, which means “leap with a flicker”. Adult birds are 28-31cm (c. 11-12 inches) long and have a wingspan of between 67-72 cm (c. 26-28 inches). They typically weigh between 140-320 g (c. 5-11.25 oz). Male and female lapwings are generally similar in appearance, but the male’s crest is noticeably longer during the breeding period. In winter both male and female birds acquire buff-coloured border to the feathers of their upperparts. Juveniles have similar plumage to winter adults, but can be identified by their short, stumpy crest. Lapwings are very gregarious, and gather in enormous flocks between June and March on tidal mud-flats, mixed farmland and inland wetlands. They feed on a wide variety of invertebrates including worms, beetles, other insects, and small molluscs. Their feeding behaviour is characteristically stop-start like other plovers: they run forward a few steps, stop dead in their tracks, poke about for some food, then run forward again. Lapwings in flight (image via Wikimedia Commons). In spring lapwings perform a spectacular tumbling display flight. They fly in wide, sweeping circle before suddenly soaring high into the air. Then they drop, spinning and tumbling towards the ground, throwing their rounded wings in all directions, but somehow always staying in complete control. They pull out of their erratic dive just inches from the ground. It’s a truly remarkable natural spectacle. Breeding takes place from the end of march to early July. The nest is a shallow scrape in the ground, into which the female lays three to four well camouflaged eggs. Incubation takes about twenty-six days, after which the well-developed chicks hatch. Like many young waders they can walk as soon as they have hatched, and proceed to feed themselves on small invertebrates. 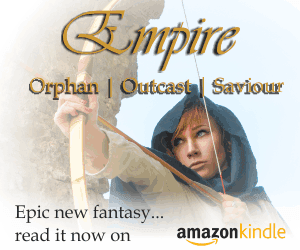 When danger threatens the young lie very still, relying on their cryptic markings to hide them. Parents with young are particularly aggressive and will mob any potential predator. If that fails they will often feign injury, dragging a wing along the ground as if broken in an attempt to draw the predator away from the chicks. 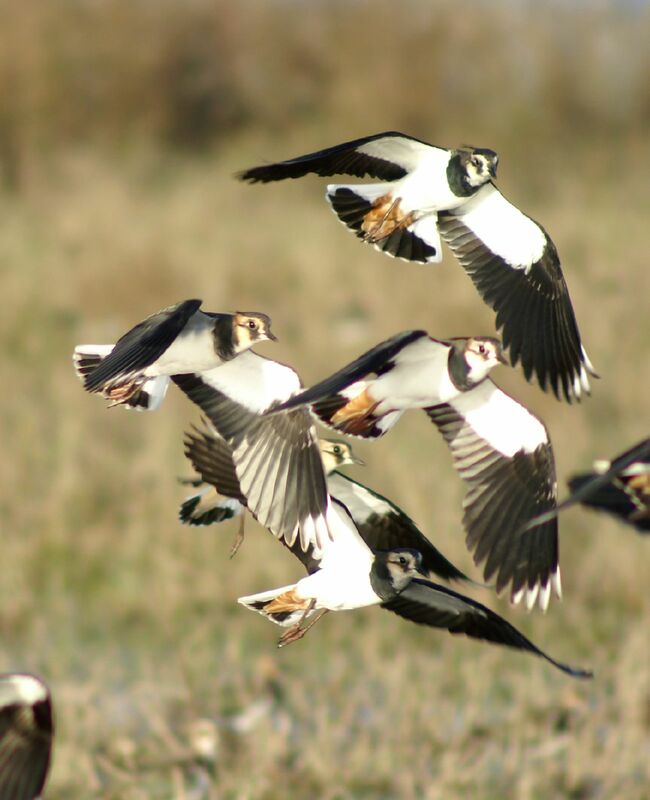 At the end of the breeding season lapwings begin to congregate in huge numbers around areas rich in their invertebrate food – particularly coastal mud-flats and estuaries. As winter approaches our resident breeders are joined by waves of birds migrating from Scandinavia and Northern Europe. Resident lapwing populations are thought to have declined due largely to widespread changes in farming. These birds particularly favour mixed farmland with a patchwork of spring-sown crops for nesting and grassland to provide a feeding grounds for young chicks. This type of farming has become scarce in Ireland today, and practices such as autumn sowing and the use of wide-spectrum herbicides and insecticides further hamper the lapwings’ ability to breed successfully here. We used to get big flocks of lapwings in our area even up to a few years back – not so much now but they do still come here. I’m worried though because there are plans for pylons and windmills in this area – Carlanstown – Co.Meath and feel we must all do something to protect what little wildlife is left in the countryside. Its very sad but it seems there will be no save place for them along with other threatened species to live. What can we do to help?